Matt and I would eat a more healthy vegetarian diet, at least a number of times a week. And next time I had my best friend (and vegetarian) over for dinner I would have a wealth of different recipes to choose from. Recipes that I know and love myself. However it didn’t work that way and the book ended up on the shelf (in fact it was lost in the basement for a period), when I finally opened it up – I was in a panic. Somewhat stupidly I had just agreed to do a Christmas dinner for my friends, for the first time to anyone ever. I had given myself less than one week to prepare. I’d had an entire year but my vegetarian repertoire was as pathetic as before. I read Plenty cover to cover, I scoured the internet, foodgawker, the guardian Christmas food sections, but found nothing that looked special enough for a vegetarian Christmas meal. veg I served at my dinner party. It’s pretty simple to make and large parts can be prepared ahead. And finally? It has the wow factor. I am not going to post the recipe here, as it is perfect the way it is. 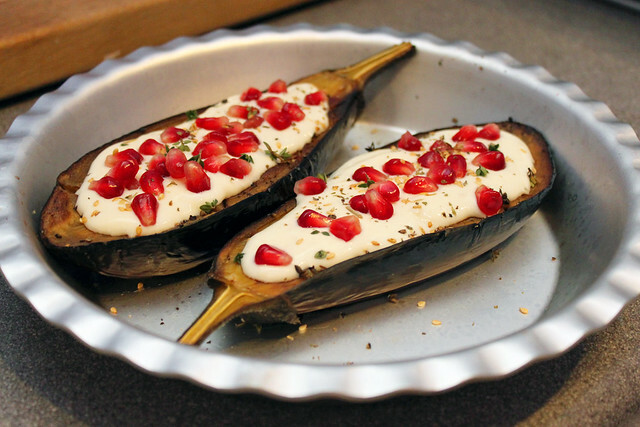 Here is the recipe I followed: Aubergine with buttermilk sauce. Za’atar – doesn’t seem to be stocked in any of the supermarkets I tried, so you may need to try further afield. I found Za’atar Spice Blend Standard Jar 50g on Amazon, but with my last minute rush I couldn’t have received it in time. 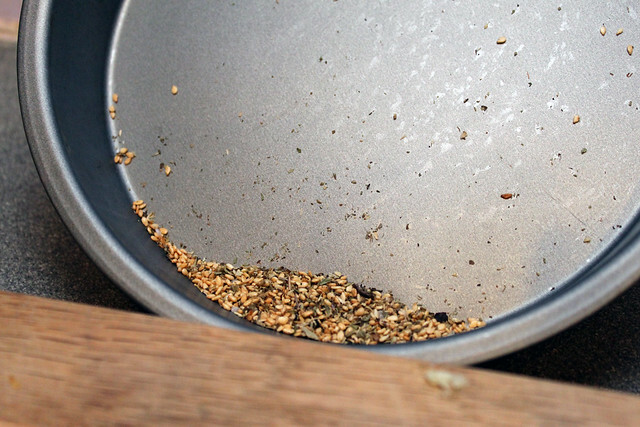 While I have no idea how authentic it is I did make a spice blend with what I had to hand: (roasted) sesame seeds, dried oregano, salt and pepper. It certainly added something to the dish and I wouldn’t leave it out. 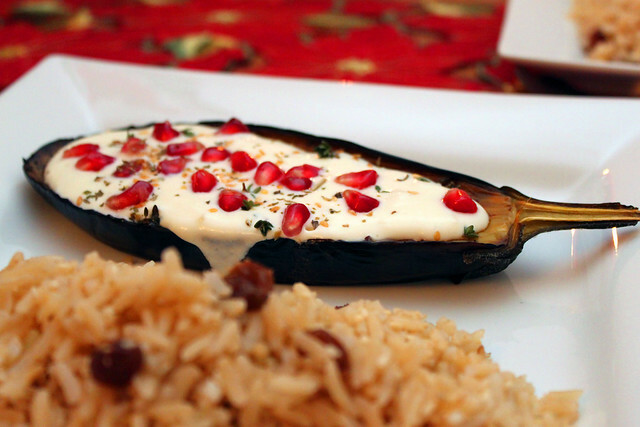 (My version misses out the sumac – as I didn’t have any, if you do, be sure to add some). Making this dish for a dinner party is pretty easy, you can make the buttermilk sauce and spice mix ahead of time and keep them in the fridge. I would definitely prepare the pomegranates ahead of time, because that can be fiddly. So all you need to do at the time is cut, score and roast the aubergine. While the roasting time is 35 minutes you don’t need to be in the kitchen for that time so you can relax be with your guests. In the recipe one half aubergine is quoted as a starter. As you can see I served it as a main meal with rice (on my trial run), this was quite a light meal, and with lots of veggies as a middle in a three courser! However if you are particularly hungry I would suggest bulking up with extra veg! I love the fact that I now have a great vegetarian recipe, especially one that’s just a little bit more special than the typical.